My whippet, Kahlil. Photo by author. My husband, David, likes to tell the story of the time he took our dog for a December run. It was late afternoon and snowing lightly. They went out to our favorite turn-around spot on the Sakatah Trail outside Madison Lake—a picnic table nearly three miles from our house. By the time they got to the picnic table, the sun had set, the temperatures had dropped, and the snow started to fall heavily. Kahlil was young and spry, and the snow didn’t faze him. He bounded and leapt through the building snowdrifts, sprinting on quick whippet legs far ahead of David. But every so often he would stop, turn around to make sure David was still behind him, and then bound quickly ahead again. Kahlil is nearing 14 years old now. He doesn’t have the stamina to run anymore, but the trail is still his. He trots along for the most part, but the old boy still has a few sprints left in him, flashes that remind us of his puppy days. I walk him a few days a week. If the weather is chilly, he wears his green turtleneck coat. I tell people that I take him on a walk otherwise he drives me crazy with the pitter-patter of toenails on the wood floor. Even in his advanced age he’s eager to go outside every morning. A 20-minute walk in the morning will turn him into a couch potato for the rest of the day, and I can get my work done in peace. A few years ago, when it was clear that Kahlil could no longer run like he used to, I cried. He had been such a faithful buddy, those runs such a happy part of his day. It was hard to lace up our running shoes and leave him behind, his nose pressed up against the window. But then I told myself that life is a cycle. Our lives and the lives of our steady companions. It was unrealistic to expect Kahlil would be a puppy forever. When one strength—such as physicality or endurance—retreats, another takes its place. Kahlil’s nature is calm now, much different than when he was a puppy and David nicknamed him “Bonkers.” Kahlil is still very much a companion, just in a different way. He may not be our running companion, but he’s our couch companion, snuggled under blankets with us while we watch TV. We have to respect our limits. When Kahlil was able to run 5, 6 miles at a time, we let him. Now, if he’s able to walk for only 20 minutes before getting tired, well, then that’s what we’ll do. He seems as happy walking for 20 minutes as he did in the days when he ran 6 miles. Kahlil is a model for all of us. He’s old, but active. I think his energy has ushered him nicely to this stage in life. A general whippet life expectancy is 12-15 years; Kahlil is starting to push that upper limit. But frankly, he’s hanging in there better than we had expected. Almost five years ago, Dr. Ambrose at Minnesota Valley Pet Hospital diagnosed Kahlil with a heart murmur. Kahlil went on medication, but the murmur quickly worsened. Another round of tears—would Kahlil even make it to 12 years old? But the murmur has been stable for a couple of years. I like to think that his regular walks are keeping his heart as strong as possible. A fairly significant limp he had for several months a few years ago has disappeared. 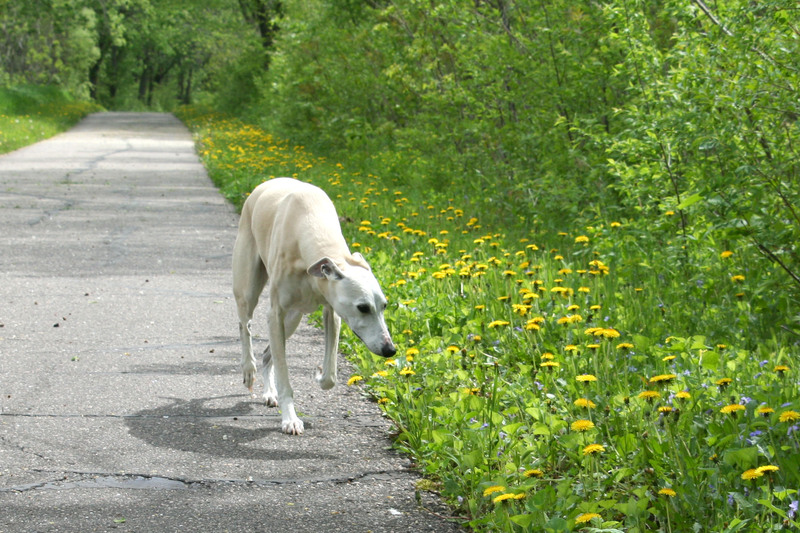 He’s deaf and his eyes are slightly cloudy from cataracts, but he can still spot a squirrel or bird on the trail and sprint after it. He huffs and puffs from the exertion, but he looks happy. I named him Kahlil after one of my favorite poets, Kahlil Gibran. It wasn’t until after we got Kahlil that I looked up the meaning of the name. Friend. Here’s to many more walks, friend. I will take you with me as long as you can go. Lovely, Rachael. As a dog lover, I could really relate. We evolved with dogs and so there’s a lot to that relationship. It amazes me how in tune many of them are with us, with our emotions. It challenges us to do that same for them and to be there for them in the ways we can. Not just when they are cute puppies but when they are old, too. I never thought much about the stages of a dog’s life, but I treat my dog differently now than I did when he was young. Where he is in his life demands that. I very much enjoy this relationship now. It’s amazing how much the stages mimic the stages of a human life. This is such a beautiful article, Rachael. Our friends come in all forms, don’t they? And you’ve been blessed with your Kahlil-Friend for so many wonderful years. We created a launching pad for our kitty in the few months before she died so she could get onto our bed. Poor kitty 😦 I think she managed to jump up there a few days before we had to put her down. But she had a good long life with us–16 years. Plenty of cuddle time. So many of us have been there. Dogs are amazing. I swear they are clairvoyant and “feel” every bit of human-ness on our behalf. Thanks for writing. So true, Sheila! Dogs are really unlike other creatures.